The following comments are based on an actual study of the book or use of the software in question rather than a rapid skim through so as to produce comments co-incidental with or within a short time of publication. Reviews are roughly in order of date of publication with the latest being at the end of the page. "Practical Rook Endings" by Victor Korchnoi. (Edited by Ken Neat). There are chess books and then there are "must have" chess books. This book by the old master belongs firmly to the second category. In the first part of the book Korchnoi describes some model positions which we all need to be familiar with since they often form the basis for evaluating possible plans in more complex endings. In subsequent chapter endings with common themes such as "an outside passed pawn" or "all the pawns on one wing" are examined in detail using Korchnoi's own games with superb objective analysis to illustrate the best lines of play in a given position. It is claimed in the blurb on the back of book that ones ELO rating will increase by 100 points in studying this book. I don't know about the accuracy of this prediction but certainly ones playing strength and enjoyment of rook endings will increase significantly and I think many half points will be saved in difficult positions and more advantageous positions converted to wins. Obtainable from Edition Olms via your local bookseller. "The Slav Defence" by S.N.Dorobanov. This CD has the novel feature of incorporation of audio in the games to help guide the person who is studying the material. This works very well and does indeed aid the understanding of the material (although I would recommend use of headphones to avoid distraction of non-chess players in the local environment!). Each of the main lines in the Slav (D10-19) are covered in sufficient detail for both the amateur or professional to get to grips with the fundamental ideas of this opening. The suggestions for a repertoire (based on specific move orders) is backed up by a large database (over 11,000) of top level recent games which in itself signifies the real resurgence in interest and new ideas in this opening. Obtain from www.dorobanov.com, BCM or Chess and Bridge. "The Budapest Gambit" by D. Oleinikov. This Chessbase CD describes not only current variations in this opening but gives a historical perspective as well. The latter shows the development of what was at first a rebellious idea against 1. d4 into a now respectable opening. Its seems this once dubious gambit has at last thrown of its reputation and become rather a straightforward way for black to equalise, and even play for a win, against the queen pawn opening. One should not of course be put off by Nigel Short's disaster when he tried to surprise Karpov with this opening-one should not expect to play such opponents too often! The material on the CD is nicely laid out so that ideas can be grasped readily, support for the development of an understanding can be tested by looking at the opening traps, strategy and test sections and these are complemented by a 4000 game database. Obtain from www.chessbase.com, BCM or Chess and Bridge. "Winning Unorthodox Openings" by A.Dunnington. This book looks at the opening moves 1.b4, 1.b3, 1.Nc3, 1.f4, 1.g3 and rarer moves like 1.g4 or 1.f3. In a sense this is an impossible book to write since (a) there is no generally agreed theory on these lines and (b) they must, even if it is in reality only slightly, be regarded as inferior to mainstream openings. Although much good material is contained in the book there are some omissions. For example if white wishes to surprise his opponent with 1. Nc3 then he would struggle if black replies with 1...b6, 1...g6 or 1...d6 all reasonable replies but not covered in the book. So even at club level players could rapidly find themselves "out-prepared " in the opening. I would suggest this book is best used as an introduction to these selected openings and further study material be sought such as for example, for 1. Nc3, the NIC CD on this first move. Obtainable from BCM or Chess and Bridge. "Sicilian Grand Prix Attack" by J. Plaskett. The fact that the author is a strong GM has, I feel, proven a handicap in writing this book which looks more like a padded out Trends booklet than a full blown coverage of this opening. Whilst one cannot fault what is said there is often little explanation for lesser players and sometimes whole lines are dismissed with a short comment. In order to fully understand this opening, for white or black, one would have to have the other books mentioned in the bibliography especially Garry Lanes book which contains more detail and explanation. After reading all these books only then could GM Plaskett's be used to look at recent trends. Sadly, a little disappointing. Obtain as for last review. "Queens Pawn Opening-Pseudo Benoni" by A. Schneider and T. Erdelyi. A neat little book on the line 1. d4 Nf6 2. Nf3 c5 3. d5 which has not previously received sufficient cover in the chess literature. Whilst the introduction is interesting, showing as it does knowledge of psychology, philosophy and the classics, the real benefit is the well selected key games for each sub-variation when black continues 3...c4, 3...e6, 3...d6, 3...g6 or 3...b5. These games and the associated comments allow for ready grasping of the ideas behind, and the differences between, these opening plans for black. Another useful book to come out of the under-rated Caissa Chess book catalogue. Obtain from BCM or Chess and Bridge.
" The Magic of Mikhail Tal" by J.Gallagher. This book covers the somewhat neglected period of 1975 to 1992 on the games and life of the enigmatic former world chess champion. Some 34 main games are included but each is heavily annotated and have been selected with care to represent the staggeringly tactical play of " Misha". A great amount of tournament, background and personal information on Tal has been included as well as some more lightly annotated games from the early period of his career. Much hard work has clearly gone into this book making it an excellent and inspiring read. As Tigran Petrosian said "I know only one chess genius" when describing Tal. One is left wondering just who would have stopped him if only Tal had enjoyed better health. One of the best books for a long time-quite likely a contender for the best book of the year competition.. Obtain from Everyman Chess. "Dutch Stonewall" by Jacob Aagaard. This book adds to Aagaard's growing reputation as a good quality author. Using some 77 complete games the Stonewall , not only those arising out of the Dutch opening, but related systems arising from the queens gambit and others, is covered in a good mixture of analysis and prose. I especially like the (real) introduction which provides some key historical games, move order considerations as well as important themes of the opening such as types of exchanges and typical plans amongst others. Much can be learned from this approach before moving onto a consideration of the main variations which are provided with clear analysis build around recent games. Recommended. Obtain from Everyman Chess. "Nimzo-Larsen Attack" by Byron Jacobs and Jonathan Tait. In a clearly very thoroughly researched book the Nimzo-Larsen is explored in detail in almost 200 packed pages. There are a couple of nice features of this book which are rare in modern publications. Firstly at many points in each illustrative game, as well as sub-games and variations there are objective comments assessing the position or possible plans which definitely helps guide the student through the material. Although to be expected from CCIM Jonathan Tait, it is nevertheless pleasing to see so many correspondence games included. Often these are critical to the evaluation of particular variation featuring new ideas or more accurate assessments of known position but are often ignored by opening books which largely concentrate on over-the-board games. The authors are also objective in their statement that there is no theoretical advantage for white in this opening but clearly opening 1. b3, or 1.Nf3 followed by b3, is a sound and solid way to begin the game and one which is too easy to underestimate. I would expect to see many players attracted to playing this opening and this book should finally remove the taint associated with this opening that remained for years following Larsen's spectacular defeat by Spassky in the USSR-Rest of World 1970 Match. Obtain from Everyman Chess. "How to Think in Chess" by Jan Przewoznik and Marek Soszynski. Thinking processes in chess are a complex issue which has been studied by the Dutch player and psychologist De Groot and later developed, amongst others, by the Nottingham University academic and OTB IM Fernand Gobet. This work is not, however, easily accessible or readily understandable by chess players in general. In addition, it is now some 25 years since the Russian player and psychologist Krogius published in the West his largely theoretical book "Psychology in Chess". IM and trainer Przewoznik and philosophy graduate Soszynski address these issues with a fascinating book containing a wide diversity of material. In contrast to earlier work much more practical information is provided which cannot fail to improve a player. How many times have you observed players at the local club saying things like " I just tried that move to see what happens without examining it in detail" or "I don't really know what to do in that sort of opening/middle-game/ending" (even though it has already occurred in their games a few times) or " I didn't even dream about that combination you played to win the game". These issues of lack of self discipline, lack of systematic study and inability to analyze positions are all dealt with in the book in chapters containing test positions for solo analysis (which essentially define your current status), discussions of the methods used to "solve" a position and even advice on developing creative thinking and improving ones self. These may even help improve a person in areas in addition to chess and one cannot say more than that. "Champions' Friend, Friendship's Champion: Lilienthal's hundred best games" Edited by G.Negyesi. At the ripe old age of 90 Lilienthal publishes his hundred best games! This one fact indicates the character of the man who seems to have made friends with many of the world-class players of this century and is even today admired by the younger generation of chess players who visit him whenever possible. This collection of games is well worth studying and feature many class wins against the strongest players of the period 1930s to 1970s. The notes are succinct and with touches of humour and irony point out the key features of the position with an understanding that clearly indicates why in his heyday Lilienthal was one of the top ten players of the world. "Excelling at Chess" by Jacob Aagaard. This is a very interesting and in some respects deep book which is based on the ideas generated by Aagaard when, already a strong player, he contemplated how to further improve his playing strength. These, often very revealing and honest, considerations have resulted in a very readable book containing many theoretical ideas but ones which are then converted into very useful practical guidance during play for club and tournament players. The basic theme of the book is that chess (a complex almost infinite system) can be to some reasonable degree be understood and played well by using a set of, not simple universal rules, but more extended dynamic rules, which are based on a good positional understanding of what is happening or might happen in a given position on the board. This understanding can be obtained from a careful study of chess using the various training methods discussed and is the reason that, predominantly, GMs see, not more, but "better" in a given position. The essence of this sort of play is exemplified in that of "real" players, better players than "great" players, who simply seem to know where the pieces belong and is a mixture of very natural moves and propylaxis. Of special interest is the chapter on unforcing play which contrasts to many players, often un-required forcing play, which gives a feeling of control but is likely not to be the strongest move in the position. All of these concepts apply to the ending which is often neglected in modern chess with its emphasis on opening study. Endings can obviously be large part of a game but might be the only place to try and win if all else has so far in the game failed. The encouragement in the arguments supplied by Aagaard is that logic and positional understanding can lead to good endgame play via consistently good, but not necessarily great, moves. The chapter on mind improvement and psychological factors shows that these features is also neglected by many players. It is now clearer to me that some chessically unnecessary loses, both of my own and chess club colleagues, are in fact due to factors such as underestimating opponents, having the incorrect state of mind and non-optimum physical status. It is also very important to know that one has to make a draw happen rather than expecting it to happen when for example an equal position is reached when playing a much stronger opponent. Certainly a book that one could have wished for some years ago. "Queens Indian Defence" by Jacob Aagaard.. Having been impressed with Aagaard's earlier efforts (see above for two examples) I find this book very disappointing. Perhaps Jacob says it all in the introduction where he indicates he wanted to write a two volume work to include, for example, positional details on this opening but editorial wishes prevailed. However, these days one simply cannot cover a complex opening like the Queens Indian in the 140 or so pages of this book. For example the variations with g3 by white and Bb4+ by black, although popular, are very sketchy and the relationship with the Bogo-indian is not sufficiently covered. Further, the line with 4.e3 gets just a few pages although great complexities can arise and numerous changes in pawn structures can occur inclusive of one which is difficult to handle for both players (hanging pawns) but these features are not mentioned. "Konigsindische Verteidigung" by Ludek Pachman. GM Pachman has a long standing reputation for good theoretical works and this is no exception. For the advanced player who already has an understanding of the basics of the KID, Pachman provides the latest GM level theoretical assessments on certain variations of the KID. These are provided in compact and very detailed Informator style with only a small amount of German text. Lines covered exclude white fianchetto lines but include the Classical, Samisch, Averbahk, 4-pawns attack and various minor lines arising from white playing 4.e4 together with 5th moves other than 5. f3 and 5.Nf3.Obtainable from Edition Olms via your local bookseller. "Chess psychology" by Angus Dunnington. Although often of paramount importance chess psychology is often forgotten about by chess players. In this book, aided by his wife Mioto-a member of the British Psychological Society- IM Dunnington addresses this problem in an interesting and useful book. The first part of the book deals with many of the off-board aspect of psychology that can lead to stress or anxiety and lead to a reduction in a players performance. The second part deals with psychological features involved in playing and studying chess, some examples include matters of style, optimising studying before and thinking approaches during a game. The final part deals with more practical matters which are illustrated in some carefully selected annotated games with an especially interesting section on dealing with a space advantage. All in all a lot can be learnt in a short time from this book. "Red Letters-the Correspondence Chess Championships of the Soviet Union" by S. Grodzensky and T.Harding. This book, the result of years of research, covers the 21 official Soviet Correspondence Championships which started in the 1940s. Such was the desire to play in these events that the last was completed a full decade after the fall of the Soviet Union in 2002. As most of the games and nearly all of the cross-tables are not available elsewhere it was well worth the effort of rescuing these from obscurity since the 80 or so heavily annotated selected games are marvelous examples of the art of postal play. In addition, some interesting, and occasionally tragic, biographical information is provided on hitherto unknown players which the results tables show winning championships, resoundly beating or finishing well ahead of other, often near or actual world-class players, whose names and deeds have previously escaped from the USSR. As a bonus the precursor events leading to the first official championship are covered in chapter one of the book. In addition about 1400 games from the championships and about 3000 from other USSR postal events, with over 1000 having at least some annotations, are included on the CD that is provided at the back of the book. Highly recommended. Available from ChessMail Ltd.
"How to build your chess opening repertoire" by Steve Giddins. Due in part to much deeper investigations, and combined with the ready availability of data through databases and the internet, the opening stage in modern day chess has grow to become even more important than previously. An expertly prepared player can expect, in tennis terms, have a big first service and thus increases his chances of obtaining a large advantage in the first stage of the game. Modern day technique is then so good even at club level that one can only rarely expect to escape from such a disadvantage. The whole question of opening selection and study is ably dealt with in this book by FIDE Master Giddins. Deriving from his experiences with a Russian trainer in Moscow in the early 90s he first of all defines the main problem affecting many of today's players of ineffective opening study and too frequent repertoire changes. In sequential chapters he then cleverly describes the key requirement for beneficial opening study and how to select openings to suite ones style. Next the pros and cons of the two approaches of having a wide or a narrow repertoire (or selecting a universal approach) are weighed up as are the two possibilities of playing main lines or side variations. The key modern day technique of selective move orders in the opening is discussed in detail as is the best way to use computers for data access and training. Both are relatively new concepts that even club players need to come to grips with as either can win a game hands down. The thorny issue of when to change openings is covered but this is such a complex issue that this section can only be, admittedly a good, guide to this problem. The final chapter covers an examination of the repertoires of some top players. It is not so much what they play that is important but why they play it and how the information from this chapter can be used in ones own games. In this sense the book is very much a self help manual and in this laudable aim Giddins is highly successful. Obtain from Gambit Publications Ltd.
"Romanian Correspondence Chess Report 2003" Edited by Marius Ceteras and Valer E. Demian. It is nice to see that the current spate of books on chess is now beginning to include some on correspondence play. This one is very much inspired by new technology and with great enthusiasm it tracks the long history of Romanian correspondence chess. This clearly shows the dramatic impact of the internet and e-mail play in the sudden surge in recent years in Romanian players entering correspondence events (but they do not neglect traditional postal events either). Given the excellent games, the lists of the many fine achievements of Romanian players, and the setting up of the Romanian CC web pages (http://www.romanianchess.org) also described in the book I would expect this to mark an increasing impact of Romanian chess on the international scene. Both as a precursor to this surge forward (his huge contribution to correspondence chess) and representative of what can be achieved are the major 5 tournaments that compromise the Paul Diaconescu Memorial event that commenced early in 2003. Visit the web site for a free copy in .pdf format. In addition there are some 400 games of Pratten, many of which are annotated. The games are a joy to play through and contain many dashing attacks and rich combinations in the romantic style. This style is perhaps nowadays somewhat frowned upon (although Nigel Short has recently called for a return to this way of playing in his Telegraph column) but the book is littered with famous names that fell victim to this method. Apart from the games and bibliographic details there is also information on the majority of WHPs tournament and match results that the author, a long term disciple, friend and opponent of WHP, has diligently gathered together. 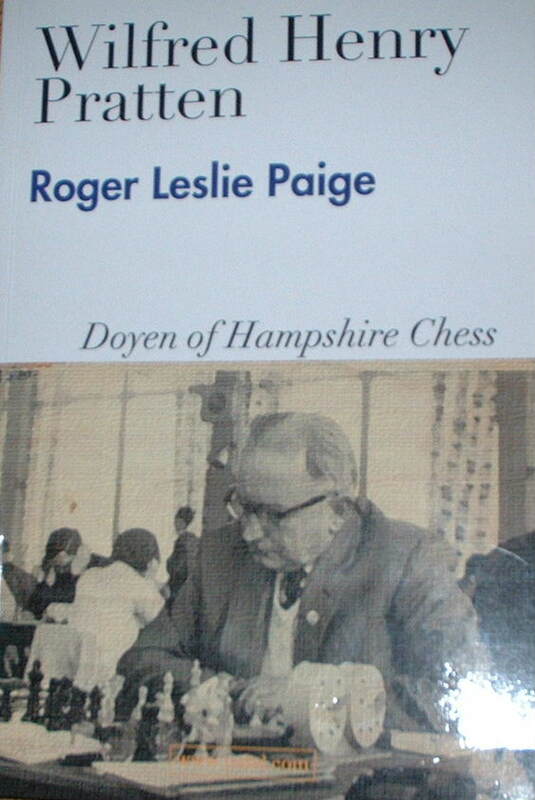 The book is a worthy tribute to a fine "amateur " player (in the old fashioned sense of the word) and, in any sense modern or old, to an excellent organiser and promoter of chess, and an obviously much respected person. 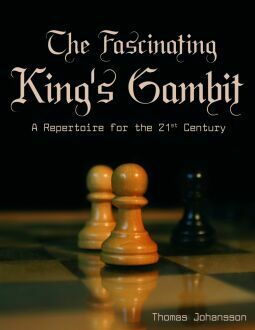 "The Fascinating King's Gambit-a repertoire for the 21st century" by Thomas Johansson. This book, probably the first serious work on this opening, covers the much neglected Bishop's Gambit (1.e4 e5 2.f4 exf4 3.Bc4). This is done in an extremely thorough and professional manner as indicated by the large sources list and the inclusion of not only over-the-board games but also correspondence games (which shamefully a lot of other opening book authors neglect to their own and readers detriment). Throughout the writing style is interesting, very readable and remains objective in chess evaluations. Over 150 years of praxis are covered in detail and many interesting new ideas are included in the notes. This should certainly help in fulfilling Thomas's wish that this opening should be taken up at the highest levels of play and help re-kindle interest in the King's Gambit which has flagged a little recently due to the current status of the alternative choice of the King's Knights Gambit (1.e4 e5 2.f4 exf4 3.Nf3). Indeed it is very helpful that a comparison of the pros and cons of these two openings is given and also lines are identified where it is advantageous to transpose from the Bishop's to the Knight's Gambit. The book is completed by an examination of the latest theory on the Kings Gambit Declined (in the form of a complete repertoire of recommendations) hence gives everything ones needs to play against 1...e5. All in all an excellent work and one that a thorough study should allow one to take an opponent by surprise and give a good chance of leading to some exciting wins. So go buy and try! (Order on line at www.trafford.com/robots/04-2455.html). "The Write Move, Edited by Tim Harding. Published by Chess Mail Ltd, (Dublin) 2005 (ISBN 0-9538536-8-3).The publication of this book is very timely since what can be described as the “electronic age” of correspondence chess is now without doubt upon us. The book principally covers the period where “traditional” (or perhaps even classical) correspondence play was carried out-that is where the player makes and sends his move unaided by electronic means such as computers and the Internet. However there is a clear connection made, and much to look forward to and ponder, by extending this period just into the electronic age. This historical breadth is achieved by collecting together a very varied and most interesting mix of contributions from around the world. These span from the time when correspondence play was first mentioned in written form (ca 1694) right up to the last year or two. The book is more than a simple anthology of chess articles as it contains much that is of general use. For example there are quite a few beautiful, and inspiring, examples of the art of traditional correspondence play. Also a lot of interesting details on a disparate range of chess personalities extending from organisers, to well known players such as Alekhine and Keres, to lesser known mortals, and also includes women players from the past up to more recent times. Unexpectedly there results a glimpse, through chess activities which touch on issues such as communication, ethics and information handling amongst others, of the development of the modern world over the last few hundred years. There are about 20 chapters or articles varying in nature from material suitable for browsing, such as poems, stories and records, through to several more serious and detailed articles that are often thought provoking. Examples of the latter include the approach to chess of GM Nesis, games analysed in great detail, and examples of the impact on play from computer use. A few articles (ca 20%) are modifications and/or updates of those previously appearing in Chess Mail. However, despite being a subscriber to this magazine from the beginning, and also being a serious correspondence player for the last 10 years or so, I still found much that was completely new and more than enough to keep me interested. Throughout there is evidence of diligent research from Tim Harding to ensure the information is as correct as possible an approach that contrasts markedly with several other chess publishers. A book I can recommend! "The Fearsome Four Pawns Attack" by Jerzy Konikowski and Marek Soszynski. FM Koniwoski and local (Sutton Coldfield Chess Club) player and web master Marek combine to produce an aptly named opening book against the very popular Kings Indian Opening. Historically this line, where white stakes out as much space as possible in the fist few moves, was viewed almost as a refutation of the KID. Of course over the years Black has found counter chances by challenging Whites large centre with c5 or e5 but the play remains extremely sharp. This book is an excellent up-to-date review of all the key lines and is supported by over 60 annotated games illustrating key ideas. This deep re-investigation clearly shows that Black is in danger of being over-ran rapidly unless he knows and understands Whites many highly tactical and complex overtures. Throughout the information is accessible by being neatly presented and with a relatively straightforward variation numbering system in contrast to a number of other opening books. A useful summary of each line is also added after each main variation and also many objective and helpful comments permeate the text. A thorough study of this book is very likely to catch your next opponent out who plays the KID and will at the very least lead to an interesting struggle. Recommended. 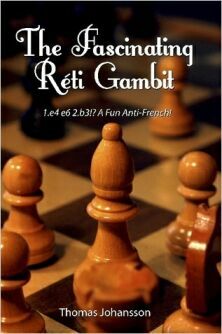 "The Fascinating Reti Gambit " by Thomas Johansson. In this work Thomas Johansson, who is developing into a very reputable author, proposes a previously little explored line for white players against the solid and counter-attacking, French Defence. In order to overcome the common situation of black chipping away at white's d4/e5 blocked centre with c5/f6 Thomas suggests instead a thoroughly researched gambit line featuring 1. e4 e6 2. b3 d5 3.Bb2 dxe4 4. Nc3 Nf6 when white can choose between Reti's 5 Qe2 and Papa's 5.g4, or if black plays 4...f5 then 5. d3 or 5.Qe2. In general in these variations the centre is much more open and piece play is freer and can thus lead to sharp white attacks-all pretty much in contrast to normal French lines. As a bonus the early b3 idea can also be effectively played against Black players who have detailed experience of Sicilian (and related lines) where c5 and e6 are utilised. As is becoming a feature of Thomas's books there is real effort made to explain moves and assessments and the text is littered with numerous new ideas or corrections on earlier works. It should be noted the book is very up to date with for example a forward written in May 2006 and contrasts with some other opening works which have taken much longer to get into print. Overall a very good addition to opening literature.